The figure below shows the layout of the bands, the multiplier and the tolerance value of a resistor. For a 6-band resistor, an additional temperature coefficient band is provided. 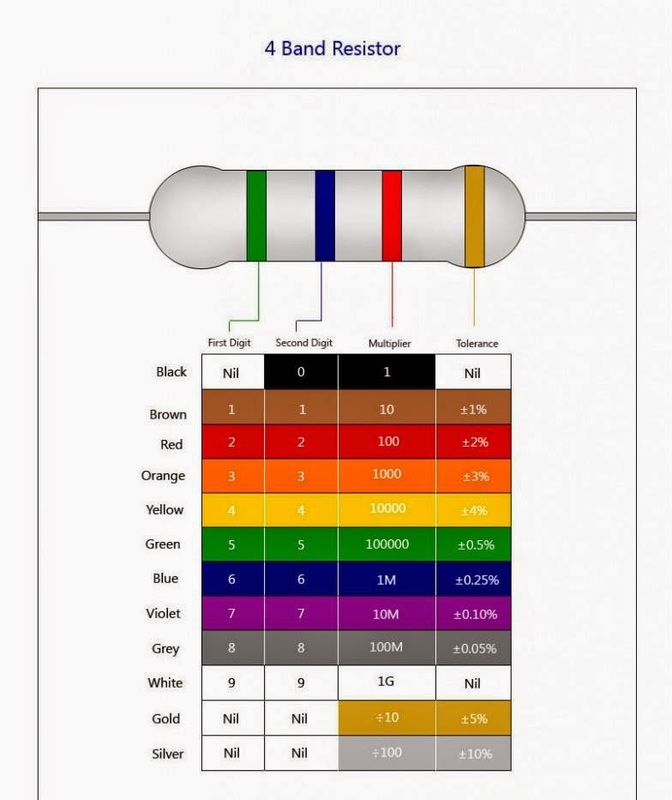 Let us consider the above color code for the resistor with the bands BROWN-BLACK-RED-GOLD. Brown corresponds to the value ‘1’ in the color chart. Black represents ‘0’ and Red represents the multiplier ‘100’. Thus the value of the resistance to the corresponding color code is 10*100 = 1000 ohms or 1 kilo ohm with the tolerance band being Gold which represents a tolerance of +/- 5%. Thus the actual value of the 1 kilo ohm can be between 950 ohms and 1050 ohms. YELLOW-VIOLET-BLACK-BROWN-GREY. Yellow corresponds to the value ‘4’ in the color chart. Violet represents ‘7’ and Black represents the value ‘0’. Brown represents the multiplier ‘10’. Thus the value of the resistance to the corresponding color code is 470*10 = 4700 ohms or 4.7 kilo ohm with the tolerance band being Grey which represents a tolerance of +/- 0.05%. we can consider the same color code used for the 5-band, with an additional temperature coefficient band with a blue color. This shows that the resistor has a value of 4.7 kilo ohms, with tolerance +/- 0.05% and with a temperature coefficient of 10 ppm/K. Color is used in electronics to identify between different components. 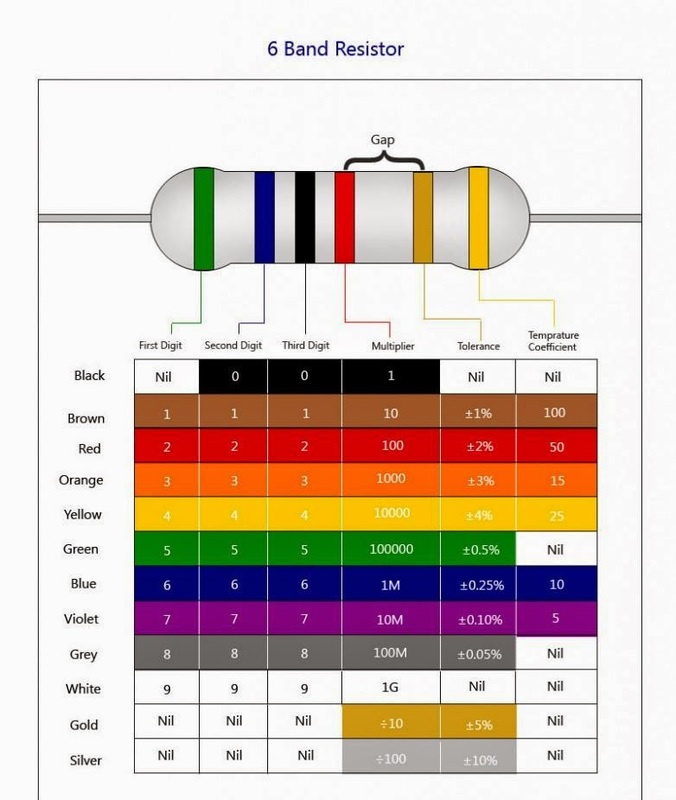 In the case of resistors, color coding is used to identify a specific resistance value, for example a 100 ohms resistor or a 1 kilo ohms resistor with 5% tolerance. Electronic components like resistors are very small in size and its difficult to print its value directly on to the component surface. Hence a standard was formed in 1920 by then Radio Manufacturers Association (now part of EIA – Electronic Industries Alliance) to identify values and ratings of electronic components by printing color codes on them. 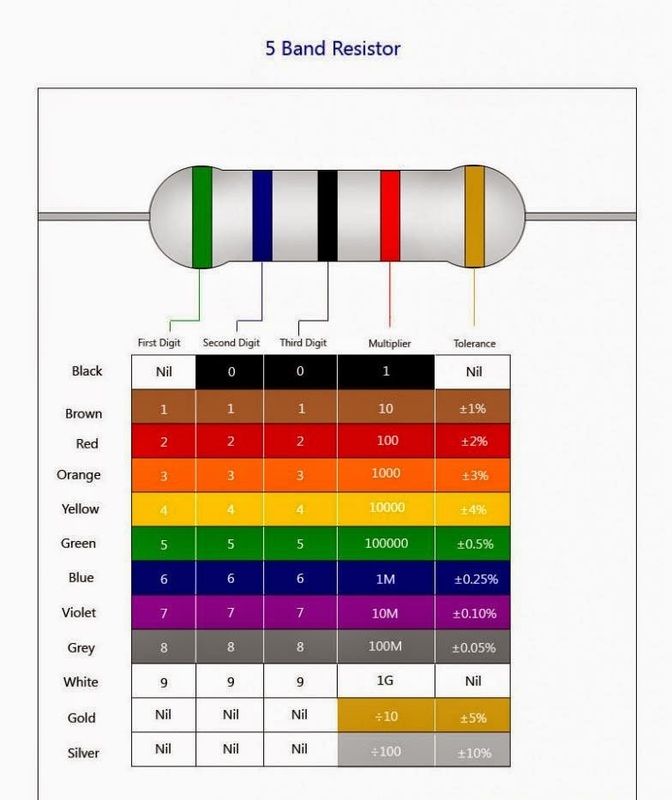 0 Response to "Color Coding Chart of Resistor"